This annoys the hell out of my colleagues, family and friends. But, I’ve learned the hard way, that taking enough time to trace things back to its roots, is worthwhile the effort. Why are we doing stuff? What’s the purpose? Only by answering these questions, we’re able to tell upfront whether an initiative is worth starting. If any doubt should surface, we need to rethink the whole idea. Because we already know that it’s going to be hard to keep up the energy for a half-baked purpose. 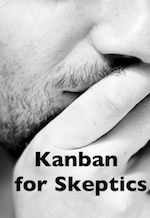 I’m currently writing an e-book, called Kanban for skeptics. It’s only fair if I ask myself: Why? I want to make Kanban more accessible to the general public. In my role as a coach, I constantly need to reassure people, that the path we follow, is worthwhile traveling. This need is often expressed in the form of critique and difficult questions. I noticed that Kanban raises tough questions on a management and leadership level, once people are introduced to the basics and start to explore the subject on their own. The type of questions Kanban triggers, seem to be much harder to answer without lapsing into an hour-long discussion. Books and conferences on the subject do not seem to address this need. People get lost in scientific and management jargon, without any clear answers on primary questions. By listing the 5 most common arguments against Kanban and my response to them, I hope to give people a response in a simple, yet profound way which is understandable by all. I would be satisfied if more people got interested in Kanban because of the book and started to explore Kanban more deeply. I enjoy writing and want to do it more. Ever since I started this blog, I realized that writing is something I enjoy a lot. My dream is to write books for a living. But I realize that I’m still far off. That’s why I need practice, step by step. Writing a small e-book (70 pages) brings me one step closer to that goal. Any other tips to improve my writing skills are more than welcome ! I want to get feedback and learn. I’m currently processing the reviews from friends and colleagues, but unless the world has finally gone apocalyptic, I will publish Kanban for skeptics in 2 weeks. I hope you take a moment to read it and give me some feedback. It’s free, by the way! We can even collaborate to create next versions, which is the beauty of the leanpub concept!